Life admin was making a day in the hills difficult and as the incredible run of hot, dry weather continued I began to get cabin fever. 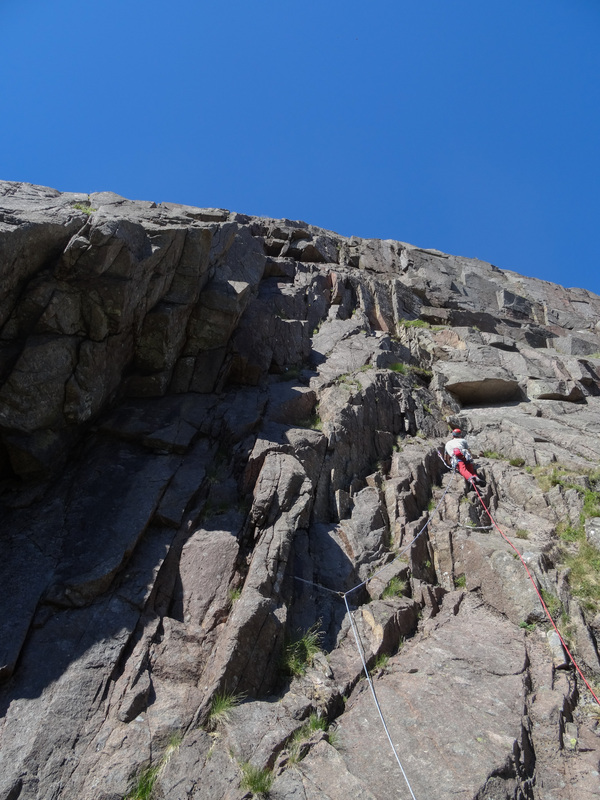 Thankfully, the amazing rock climbing conditions showed no sign of disappearing and with psyched partners lined up, a route on Creag an Dubh Loch was in order! 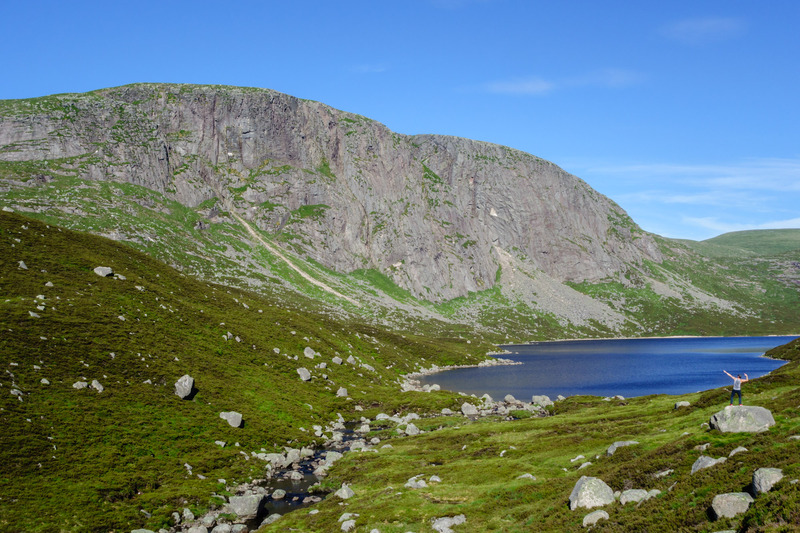 The approach in summer is a doddle, with 25 minutes of easy cycling then another hour and around 400 m of ascent to the base of the crags. 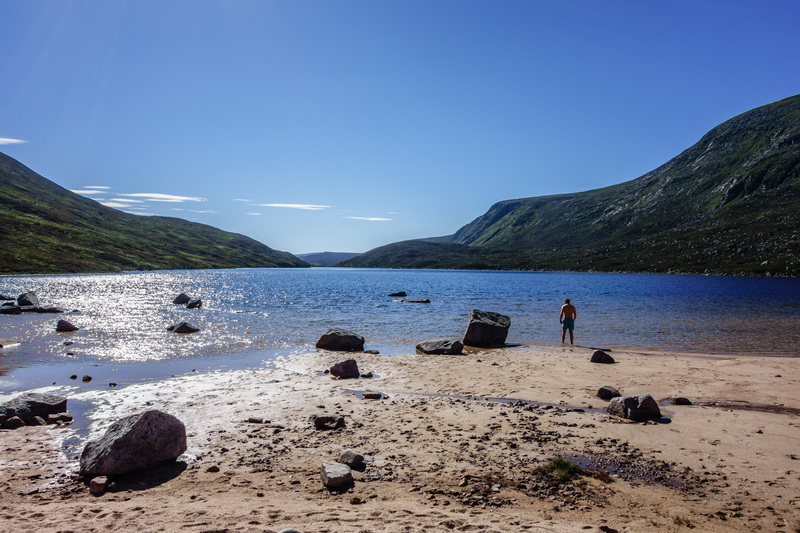 We met Callum and other friends at the end of the loch, where they had spent the night in five star surroundings. 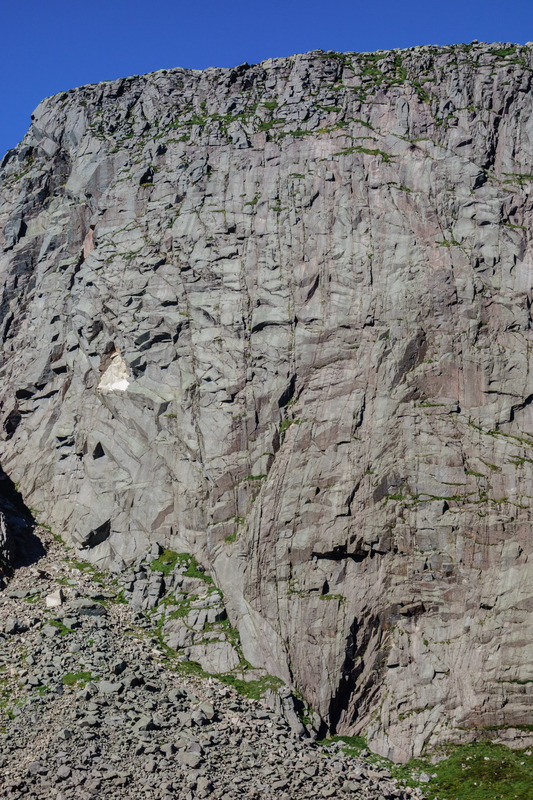 The 200 m high Central Gully Wall with the infamous roof of King Rat on the lower right had side. What a cliff! 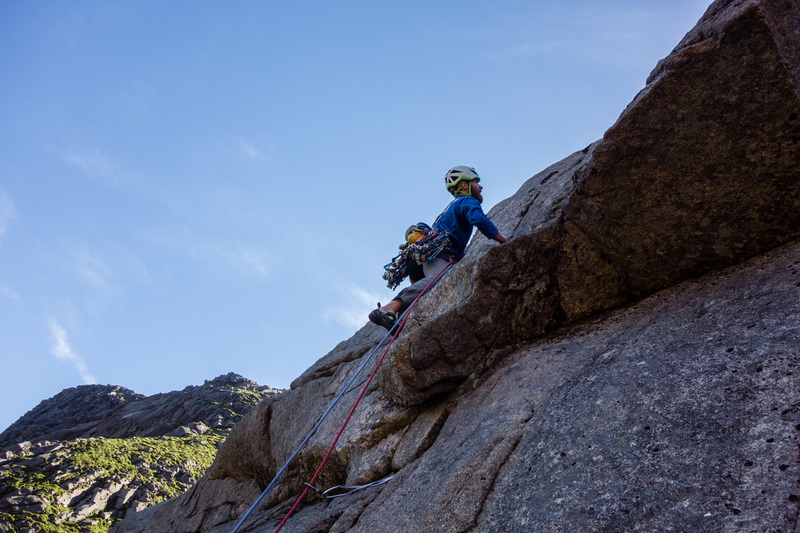 For a big bad remote cliff it was ironic that our plan A was already taken, but with more than enough rock real estate to go around we opted not to follow another team and headed for the route next door – King Rat (E1, 5c). 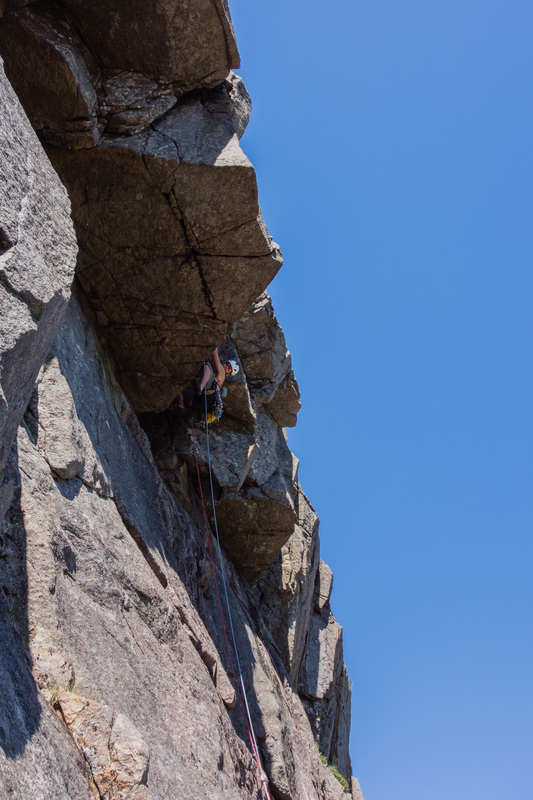 Hardly a consolation route, this brilliant climb is really a sustained VS masquerading as an Extreme, thanks to a notorious section through a massive roof on pitch 2. Lets say it was due to the heat, but a relaxed and blase’ start saw us immediately off route and heading towards Waterkelpie Wall. 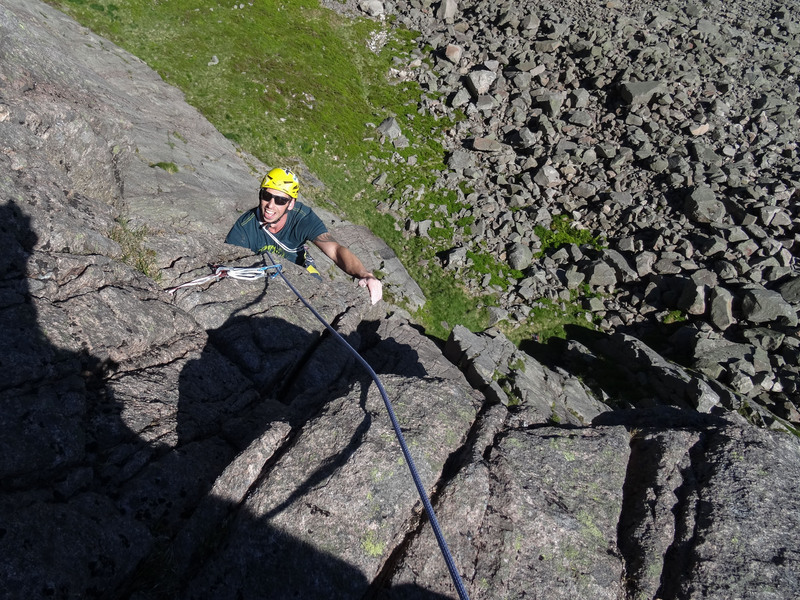 Realising my mistake too late resulted in a bonus pitch, which Joe lead horizontally across ribs and slabs until a move through a steep bulge took us to the ledge beneath the glory pitch. 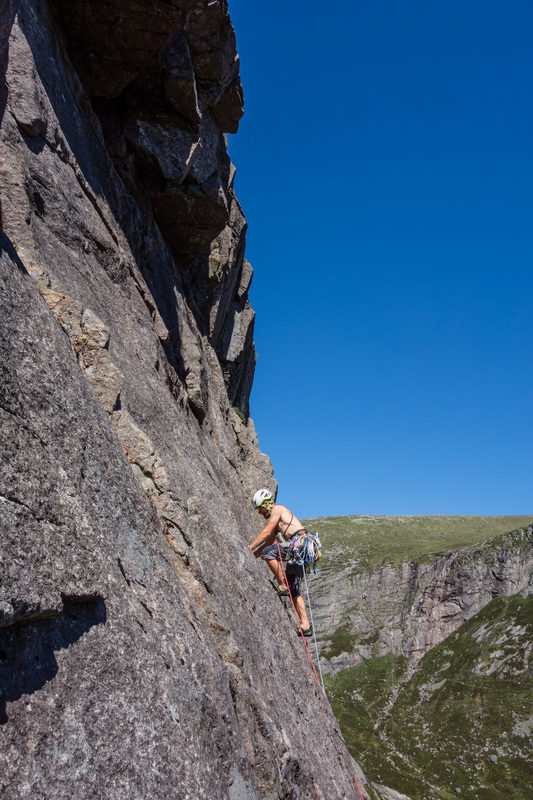 Callum approaching the main event up some mellow slabs – a pitch of two distinct halves! Ever since climbing The Mousetrap in 2013 I had wondered when the challenge of the King Rat roof would eventually present itself. But today was the day and in such perfect conditions nothing but success would do. Callum ambled up and across the baking slabs to arrange some gear beneath the hanging groove in the roof, then pulled though in a series of spectacular moves. In reality the crux was quite amenable and is best thought of as a f5+ boulder problem with good protection. 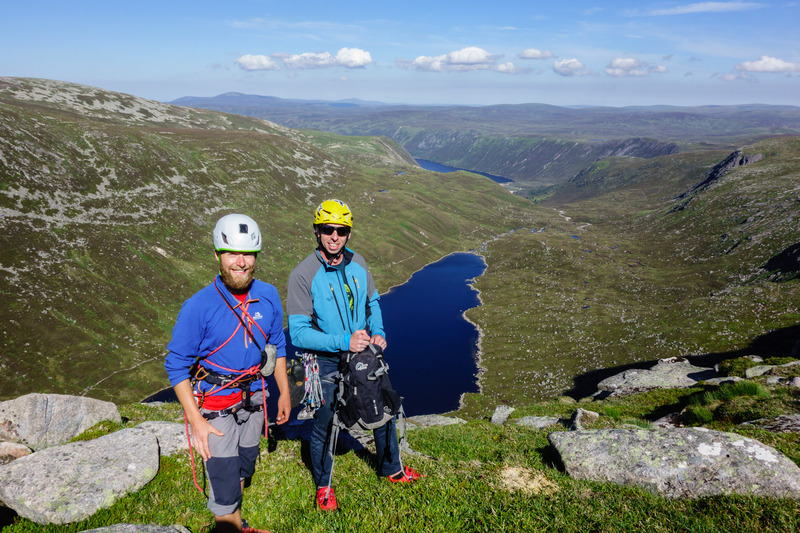 Joe and I joined Callum above the roof and were presented with a huge sweep of steep slabs above and a spectacular panorama opening up below. 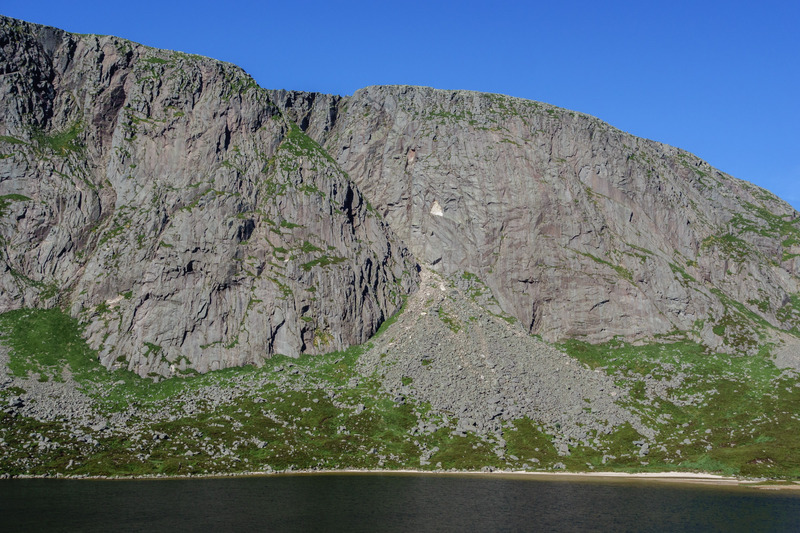 Linking guidebook pitches 3 and 4 into a 55 m monster saw my hubris taught a lesson, for this is the Dubh Loch and even the “easy” pitches need to be treated with respect. The line wasn’t obvious and slight deviations from the ideal path can result in much harder climbing. That said, the climbing was fantastic! The tricky 4c bulge at the start of pitch 5. 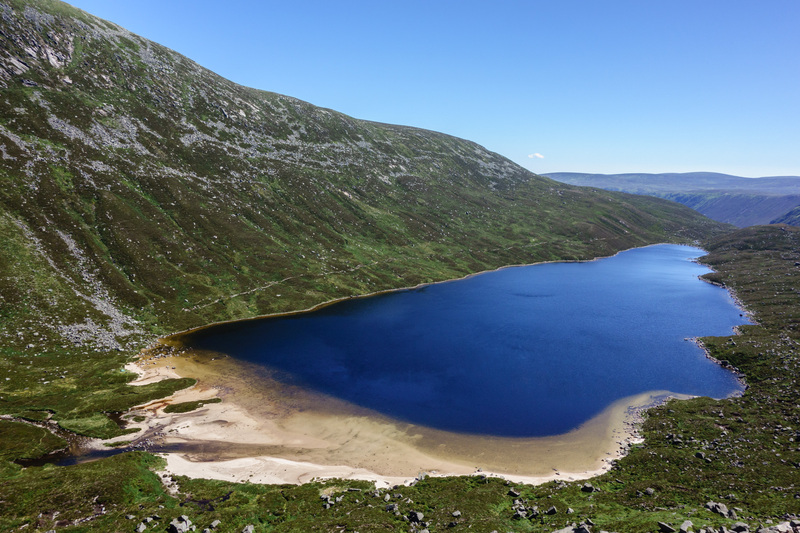 Even the VS pitches take a bit of thought on the Dubh Loch! 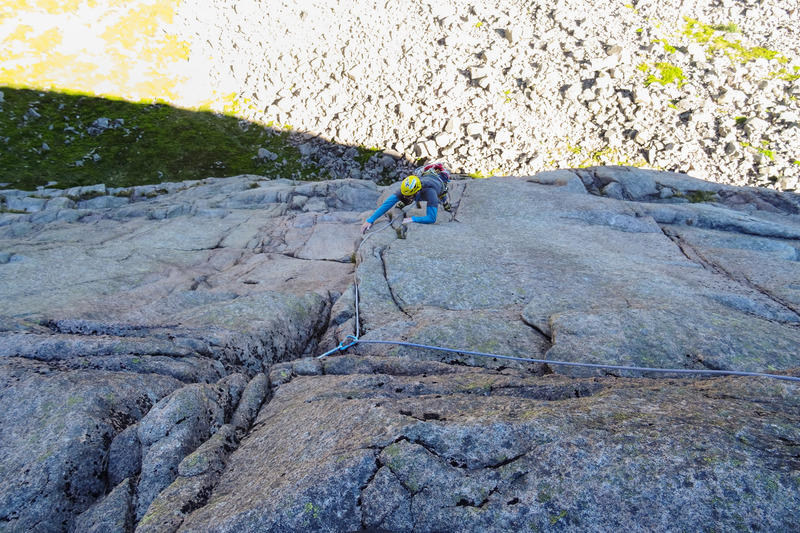 A short pitch from Joe allowed Callum to link 6 and 7 together up more flared slabby cracks of perfect granite. 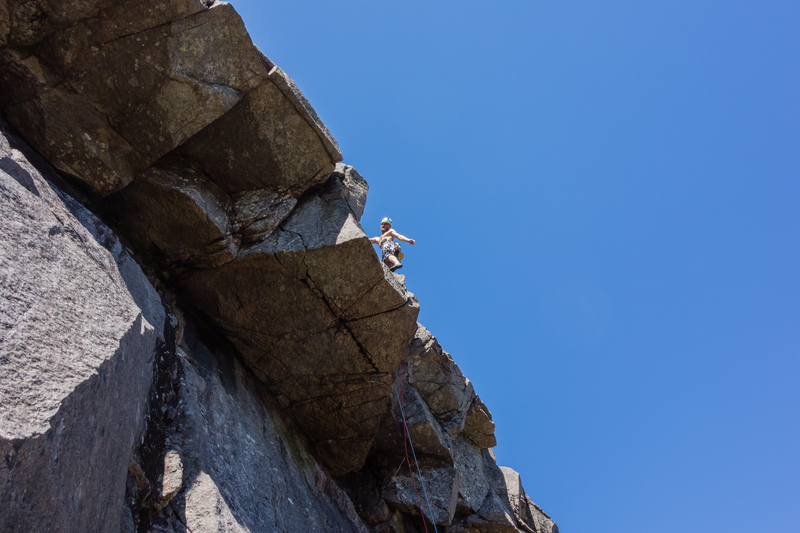 I then took us to the grassy jumble of crags at the top of the cliff before Joe led us on a long traverse to easier ground. We untied, donned trainers and soloed the remaining steps to the top.